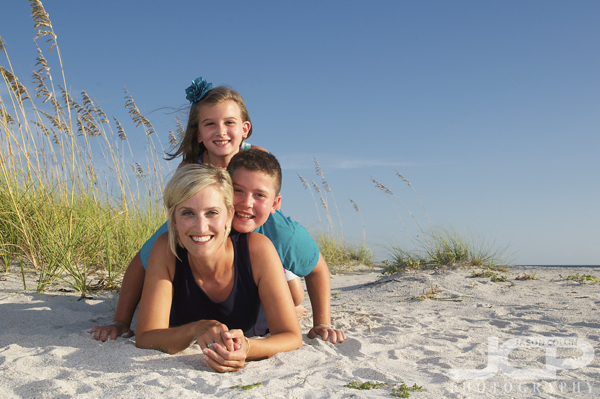 Sunset Beach Treasure Island Florida Family Beach Portraits with 8 kids! 8 kids on Sunset Beach Treasure Island Florida - Nikon D300 Tamron 17-50mm @ f/5.6 ISO 200 1/160th - Strobist: SB-800 to frame left & SB-600 to frame rightVisiting from Ohio, I got a call about a beach portrait session from Jill who wanted portraits on Sunset Beach on Treasure Island Florida of all of her family, which included 8 kids and 12 people total! As you can see, all the kids were thankfully about the same age and they all got along so it was much easier than I thought to get all 8 kids in multiple shots over our nearly 90-minutues of actual shooting time. All 8 kids rolling in the sand on Sunset Beach Treasure Island Florida - Nikon D300 Tamron 17-50mm @ f/5.6 ISO 200 1/250th - Strobist: SB-800 to frame left & SB-600 to frame rightThe family wanted the kids to be the focus of the shoot, so most shots only featured the children. The kids themselves had plenty of ideas for shots and were willing to get down on the sand, which meant I also had to get on the sand to get to their eye level for the above shot. Getting a ride from her brother on Sunset Beach Treasure Island Florida - Nikon D300 Tamron 17-50mm @ f/11 ISO 200 1/200th - Strobist: SB-800 to frame left & SB-600 to frame rightHe and I were both thinking the same thing when I suggested he give his sister a piggy-back ride for their portrait with the tall sea grass as a background. Mom and her two children on Sunset Beach Treasure Island Florida - Nikon D300 Tamron 17-50mm @ f/11 ISO 200 1/200th - Strobist: SB-800 to frame left & SB-600 to frame rightWhen mom is willing to get on the sand and let her kids sandwich her, that is making a sacrifice for the photograph! I was on the sand too and was glad to have a chance to try this more dynamic beach pose. Dad and his three daughters on Sunset Beach Treasure Island Florida - Nikon D300 Tamron 17-50mm @ f/11 ISO 200 1/200th - Strobist: SB-800 to frame left & SB-600 to frame rightMy idea for this shot of a father with his three daughters I wanted to show all the girls surrounding their dad and being as close to him as possible. Dad was set first as the anchor of the group and then each daughter wedged in next to him.